I have previously featured one of Gus Gordon's other books (titled Somewhere Else), on the blog here. His latest release is The Last Peach, which tells the story of two insects that discover a beautiful peach on a hot summer's day. The peach looks so delicious that the two insects both want to eat it. Will they come to an agreement and share the peach, or will neither of them get to enjoy it? The illustrations in this book are quite unusual and appealing. 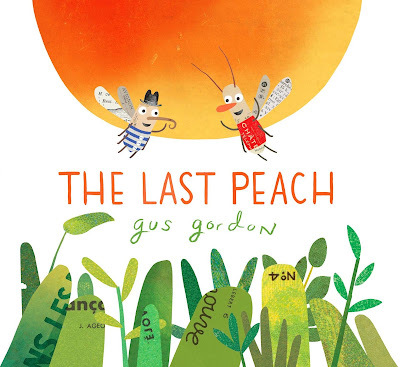 I adore the end papers which are adorned with delicious-looking peaches!